Ninety minutes in the Summer of Love all over again: grand gift of travel for Baby Boomers like me. We were there once. Happens every day in San Francisco in a psychedelic-painted bus with 16 projectors, sound system, professional actors and news clips to tell the history. This is rolling theater and documentary, sightseeing and remembering. Hard to think anything could rival San Francisco’s romantic cable cars but The Magic Bus does. Of course, I’d say ride both. Good to be with a lover, but the kids should do the Magic Bus too. Bench seating, facing the windows. Curtains close and documentary footage, music and narration unroll. 3-D glasses, familiar voices like Allen Ginsberg, Timothy Leary, Alan Watts, the Beatles. 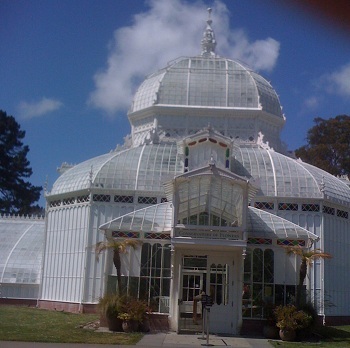 The Golden Gate Park and Conservatory of Flowers: gathering places for hippies, and travelers today. Sometimes the curtains roll up and you’re in the real places: Haight Ashbury, Golden Gate Park, North Beach, Chinatown. Stunning connection. Flower power we still know; getting off the Magic Bus at the Conservatory of Flowers in Golden Gate Park helped me remember where the phrase gained traction. 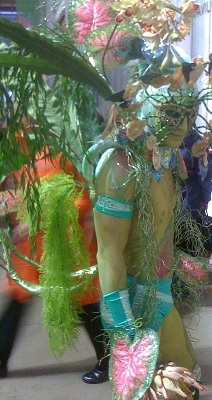 Flower power didn’t end with the ‘60s Summer of Love. Lots of ‘60s hippies in Golden Gate Park. I was in Missouri studying journalism but I noticed. Rosa Parks and her bus fit in the dialogue, but the anti-Vietnam War movement does not. Familiar fragrances waft through the bus now and then, but only candies are handed out. I think my little kids wouldn’t notice and the bigger ones would just smile at me. 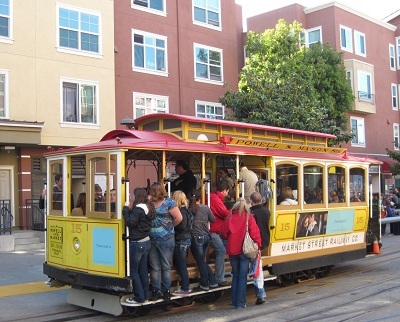 San Francisco cable cars are romantic and family fun. Jefferson Airplane is aboard the sound system, with Janis Joplin. Bob Dylan and Country Joe and the Fish re-touched my soul, and Jimi Hendrix and Simon and Garfunkel made me feel lots younger. I wanted to get off the bus at City Lights Bookstore and buy some Ginsberg poetry, but that stop is just to see. Thoughtful reflective experience for me this $40 rolling theater. Now I’m blending Magic Bus memories with the ones I already had. Top Photo: Actress Sarah David in front of the Magic Bus, film and music history of the Summer of Love in San Francisco.